Aberg Center student Maria Torres accepts the check from the Mexican Consolate's IME BECAS program. 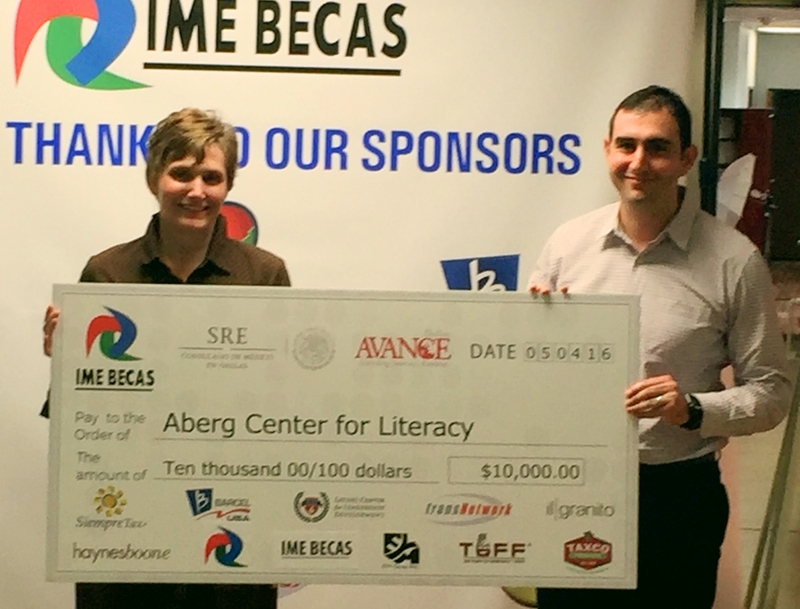 On May 30th, Aberg Center for Literacy was honored to receive a grant from the IME BECAS program at the Mexican Consulate of Dallas. The program provides vital funding to local organizations that serve Mexicans in America and those of Mexican descent with programs that enrich and empower through learning. IME Scholarships is a program of the Government of Mexico that seeks to expand the educational opportunities of Mexicans abroad who seek to pursue basic, university or technological education. With the IME Scholarship Program, the Government of Mexico seeks to facilitate the academic and professional development of Mexicans in the United States, with the purpose of integrating and contributing better in the society where they live, as well as to link their knowledge to development. of their places of origin in Mexico. Since 2005 IME BECAS has funded over 100 local educational programs. 2018 is the second time that IME BECAS has awarded Aberg Center with a grant. The $3,000 grant will go to support Aberg Center's Spanish Adult Basic Education (ABE) program, Spanish GED, and English Fluency classes, which are crucial to enabling Mexican immigrants the opportunity to raise their literacy level in Spanish and English, as well as attain their high school diploma in their native language. Aberg Center student Maria Torres was on hand to accept the grant check. Maria, a student in both Aberg Center's ESL and Spanish ABE programs, and a former Citizenship student, is a prime example of the type of student that IME BECAS is enabling. Through these programs, Maria is able to gain her citizenship, earn her high school diploma, and increase her English fluency, greatly improving her life and the life of her family here in the United States. The Spanish GED class studies four times a week to earn their High School diploma in Spanish. Each year the Mexican Consulate of Dallas distributes grants to organizations specializing in services to the Mexican community here in North Texas. The program, titled IME BECAS, provides key funding to our adult literacy programs, in particular our Spanish Adult Basic Education program (ABE), Spanish GED programs, and English Fluency classes. Many Mexican immigrants arrive in the United States without a high school education. This, coupled with low fluency in English and lack of understanding of the culture, make finding gainful employment difficult for many. The Mexican consulate's Plaza Comunitaria program, adopted by Aberg Center for Literacy in the Fall of 2015, allows students without a primary school or secondary school education to earn that in their native language. The Spanish GED program, long a staple at Aberg Center, remains a crucial option for students seeking a high school diploma but lacking the fluency or confidence to take the test in English. The Spanish ABE program also helps students who want to learn English but have a low literacy level in their native language. A student who is illiterate in Spanish is unlikely to have the base skills necessary to successfully learn English and generally struggle to improve. In these cases, students are encouraged to enter the Spanish ABE program prior to entrance into English Fluency classes. Once a student has adequately raised their literacy level in their own language they are able to enroll in English classes with the confidence and basic skills necessary to succeed. Together, these programs, supported by IME BECAS, provide a vital piece of the literacy puzzle that English programs fail to adequately address. ¡Pachanga! Aberg Center's 15th Anniversary Fiesta is one month away and shaping up to be the event of the season. The celebration would not be possible without the contributions of the following generous event sponsors. Thank you to our wonderful sponsors for their support of this event. The “American Dream” ideology is a notion that resonates worldwide. This concept of prosperity and upward mobility for families and communities is what attracts so many people to this country. Hoping that hard work and determination will allot them the life they’ve always wanted. Aberg Center student, Liliana Huerta is going for her “American Dream” with those very aspirations in mind. Born in Guanajuato, Mexico, Liliana was 1 of 8 siblings growing up. The long distance from schools and economic hardships prevented her from getting the education she needed. “I worked in my mother’s clothing store to help support our family so there wasn’t a lot of learning time.” recalled Liliana. She knew if she wanted to fulfill her dreams, she would have to take a big step, leave her home and seek an education in the United States. Liliana arrived in the U.S. at age 21, unsure but resilient. She knew that learning to read and speak English would help her odds of future success tremendously. She also knew that there was little chance of finding a learning facility where she could afford tuition for classes. A friend recommended her to a nonprofit that specialized in literacy programs and learning the English language with no tuition fees. Liliana’s decision to take classes at Aberg Center would change the course of her future forever. Liliana signed up for English classes and was very nervous after her first day. “I was shy and in a new place…” Liliana remembers. But more importantly, she believed in herself and knew that Aberg Center had provided her with the opportunity to learn in a healthy, inclusive environment. Fast forward to 2017 and Liliana is thriving! 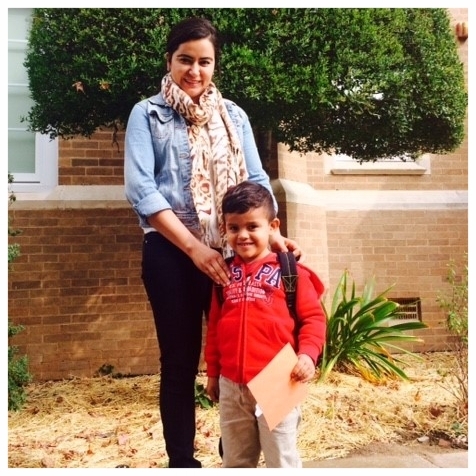 She is currently enrolled in the ESL Level 5 class and also has her youngest son, Mateo, enrolled in the Early Childhood Program. She has done so well in her studies that she was able to take and pass the citizenship test in English and is now a United States citizen! Her next goal is to become a high school graduate by acquiring her GED. She still travels home every Christmas to see her family and show them how far she has come. “I miss the food and the culture back home, but I’m glad I can go back and visit every year.” she says. Liliana credits Aberg Center for helping her to provide for herself and her family. “Helping others succeed is what Aberg Center does. They took me in, changed my life and can help so many people with their literacy programs.” she says. Liliana hopes to pursue a career as a dental assistant when she finishes her studies. Her current and future achievements are examples of why Aberg Center for Literacy will continue its mission of building richer lives, stronger families and better communities. On #GivingTuesday, everyone can have an impact! Join us on 11/28 by giving to Aberg Center! Belo Mansion was abuzz last Thursday morning as Aberg Center took center stage for its 8th annual Legacy of Literacy breakfast. This breakfast celebrates the hard work and determination of the many individuals that contribute their time and money to the continued growth and success of Aberg Center. 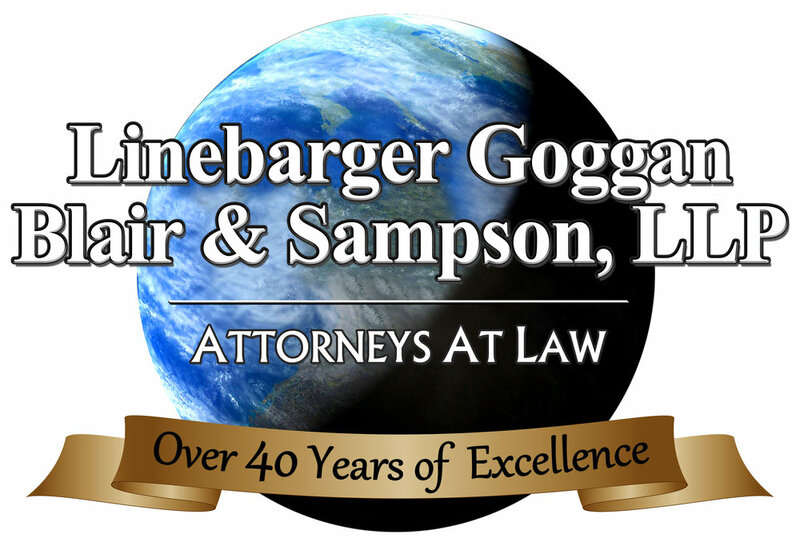 This year is especially significant as we celebrate our 15th year of service in the DFW area. Anna de Haro, Public Affairs Director at iHeartMedia, graciously hosted the breakfast and Victoria Neave, attorney and Texas State Representative, was the keynoter speaker. Todd Williams, a longtime public education advocate in the Dallas area, received the Aberg Literacy Advocate Award and we also recognized past board presidents Charles Aberg, Becky Clontz, Janet Schoenecker, Holly Greef, and Mary Carter for their years of service and leadership to Aberg Center. Our student speakers were uniquely effective as they spoke about the direct impact the programs at Aberg Center have had on their lives. Curtis Major spoke about his struggles to finish his education after many setbacks and how he is now closer than ever to becoming a high school graduate. Student speaker, Marta Velazquez, expressed her gratitude to Aberg Center for helping in her pursuit to one day become a school teacher and for allowing her to play a more active role in the education of her children. Celebrations of dedicated service and stories of resilience and determination made for an interesting start to the day. Aberg Center also started a matching funds challenge following the breakfast to help us continue our mission of building richer lives, stronger families, and better communities. We want to thank our co-chairs, sponsors, donors, host committee, board members, staff and volunteers for making the 2017 Legacy of Literacy breakfast a smashing success! The Aberg Center has a generous commitment of $12,000 in matching funds, and you can help turn it into $24,000. For every donation up to $12,000 that the Aberg Center receives by Friday, November 3rd, gifts will be matched dollar for dollar! Click the button below to support adult and family literacy programs that build richer lives, stronger families, and better communities. Ribbon cutting ceremony for newly renovated Casa Linda Center with TREC Dallas Young Guns Project. Aberg Center's Casa Linda location has another reason to be proud this fall. Thanks to a collaboration with Casa Linda Church and the TREC Dallas Young Guns Foundation Project, the learning facility has gone through a complete transformation. The building now features a newly renovated computer lab and updated classrooms. The TREC Dallas team also helped construct furniture, donate books and raise additional funds for the Center. They also brought on several of their partners to help with the upgrades. EHPConsulting, Precision Flooring & Demo, Carrco, Drywall Interiors, PDL Floors, Kellen Flooring, Gentzler, Gordan Highlander, and Armstrong all played major roles in bringing this project to completion. "We have a really good group of people around us and when we told them what we were doing, they were excited to come on board and help." says, Kim, TREC Dallas Project Manager. You can already see a difference when you enter the building. The space is up to date and more conducive to learning and providing quality programs and services. The revitalized learning center is a very encouraging sign for a growing organization. Our high-touch, project-based approach is led by TREC members who identify, review and select the Community Projects we pursue each year. The selected organizations receive funding along with the pro bono professional services of our members. We work to strengthen the community through good works in four key areas: education, housing, job creation and the environment. 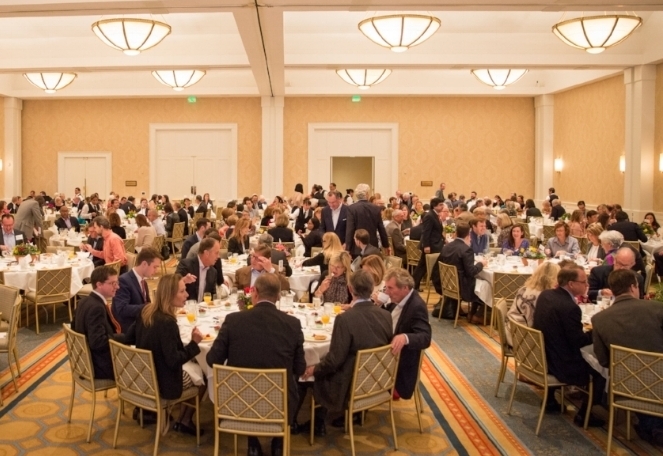 Since its inception in 1994, The Real Estate Council Foundation has contributed nearly $10 million in grant funds to more than 100 nonprofit community organizations supported by professional services valued at more than $750,000 annually. On October 17, 2017, Aberg Center for Literacy was awarded the Orix Foundation Grant. This grant goes towards expanding family literacy programs and early childhood program staff. Aberg Center for Literacy has made many strides this past year to expand its programs at the Casa Linda location in order to greatly increase the number of families served. However, further expansion is necessary to meet the growing needs of Dallas families. The Orix Foundation grant will help get us that much closer to our goal of building richer lives, stronger families and better communities. The Orix Foundation is committed to advancing education, strengthening communities, and improving lives. The Orix Foundation wants children and families to succeed - in school, in the workforce, in life. The company’s former CEO started a committee to investigate how the company could best contribute to charitable causes, and the ORIX Foundation was born in 2009. This is an employee-driven venture philanthropy that is focused on the communities where ORIX employees live and do business. The city of Dallas and the Dallas metropolitan area are at the heart of this grantmaking. Through its charitable giving program, ORIX has awarded over $8.2 million to charities, specifically ones that promote the health, welfare, and education of children, families, military personnel and veterans. In a recent year it gave out at least $2.1 million in 18 grants to nonprofits. This is a good foundation to get in touch with for basic services like food, shelter and medical attention. It’s also a big supporter of local education. Grantmaking has been on the rise in recent years. A sincere thank you to everybody who attended the Spring Fling on Sunday, April 23rd or who supported Aberg Center this past week by slipping on a new pair of sabahs. All last week partial proceeds from the sale of any pair of sabahs went to support ABERG CENTER for LITERACY's SPEAK|WRITE|CONNECT approach to literacy. Without the support of generous people like you Aberg Center would not be able to offer high quality tuition-free programming 200+ adults and children this year. A special thank you to Sabah House for hosting this stylish week of fundraising benefiting Aberg Center. Thank you to our Legacy of Literacy Breakfast 2016 Sponsors! A big thank you to the 2016 Legacy of Literacy Breakfast sponsors for supporting adult and family literacy and for making the event possible. We are ecstatic to have Dr. Michael Hinojosa as this year’s keynote speaker and to honor Krys Boyd on Thursday, October 27 at Belo Mansion from 7:30 to 9 a.m. Yes, we know it’s early, but we promise that the experience is worth getting out of bed extra early! Please join us to celebrate the Legacy of Literacy! On Wednesday, May 5th The Mexican Consulate of Dallas (el Consulado General de México en Dallas) and AVANCE-Dallas teamed up to award their 2016 IME BECAS scholarships. This year the IME BECAS scholarship pool doubled from the previous year, with 15 organizations awarded the grant of $10,000. This year, Aberg Center for Literacy was lucky enough to be one of those awardees! Aberg Center for Literacy Director Shana Harrison was on hand to accept the scholarship from one of the generous corporate sponsors. The IME Becas Scholarship Program funds Adult education programs including financial support for Mexican or Mexican origin adult students to enroll in basic literacy programs, Elementary and Junior High, GED preparation courses, computer skills classes or English as a Second Language (ESL) classes, occupational training and job skills certification; and Higher education programs including financial support for outstanding Mexican or Mexican origin students living in the United States and pursuing a bachelor’s degree. is made possible through the generous support of the North Texas community. Univision were also on hand to record the festivities, which included a number of speeches from key leaders of the Hispanic community in North Dallas. The event also marked the final for Octavio Tripp as Mexican Consul to Dallas. Mr. Tripp, a great advocate for education during his time as Consul, has been promoted to a new position. We would like to thank Mr. Tripp, the Mexican Consulate of Dallas, AVANCE-Dallas, and all of the wonderful sponsors for this great gift and hope to use it to carry out their vision! Generous Donors make Literacy in Motion Possible!